Sommore reigns as the undisputed “Queen of Comedy.” This trendsetting, highly-acclaimed veteran entertainer is widely considered one of America''s top comedic female entertainers. With a winning combination of class and sass, Sommore offers audiences a hilarious, yet piercing look at today''s issues from a woman''s perspective. She is frank and fearless in her routines, tackling topics that range from the mundane to the controversial with wit, intelligence and style. Praised by critics, respected by her peers, and adored by a diverse fan base, she performs her stand-up act to sold-out audiences across the country, and she is among the top-grossing stand-up comediennes in the United States and abroad. Oprah Winfrey proclaimed her “a force to be reckoned with in the new millennium.”Born in Trenton, New Jersey, Sommore has had a meteoric rise to the top of her field and has been a trailblazer for women in the comedy business. She was the first woman to host BET''s ”Comic View,” presiding over the 1994-1995 season, and in 1995, she received the Richard Pryor Award for Comic of the Year. 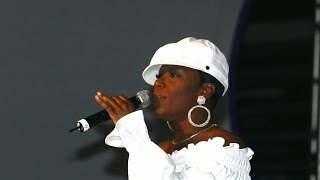 She also has hosted Russell Simmons'' “Def Comedy Jam,” and “Showtime at the Apollo.” She was part of the record-breaking “Queens of Comedy” tour in 2000, which garnered Sommore a wider fan base and got her registered in Guinness'' Book of World Records when she performed to a captivated audience of more than 50,000 people in Atlanta, Georgia. The 2001 made-for-television movie based on that tour was the highest-rated and longest running special in the history of the Showtime Network. Never one to rest on her laurels, Sommore was a featured comic in the “Latham Entertainment Presents” tour in 2002, where she was the only woman performer. In 2002, Sommore made her film debut in Friday After Next. She has also been featured in a number of other films including, Family Reunion (2002), Soul Plane (2004), Something New (2006), and Dirty Laundry (2007). Sommore has been a featured guest on “The Oprah Winfrey Show,” “The Tonight Show with Jay Leno,” “The View,” and “Politically Incorrect with Bill Maher.” She was interviewed on CNN Headline News about her phenomenal artistic and financial success as a comedienne, and was profiled in Comedy Central''s “Special Women in Comedy” program. Other noteworthy accomplishments for Sommore include several appearances on the sitcoms "The Hughleys" and "The Parkers," HBO''s "SNAPS" and MTV''s "Wild ''N Out." Sommore also participated in season six of VH1''s “Celebrity Fit Club", Comedy Central''s "Roast of Flavor Flav," and was a regular on NBC''s game show “1 vs. 100” during the 2008 season.More than a comedienne, Sommore is a writer, producer, and entrepreneur. She wrote and produced “The Queen Stands Alone,” a filmed version of her stand-up act, which debut on Comedy Central in September 2008 to over 800,000 viewers. The DVD is currently in stores and is one of the best sellers among stand-up films. In 2010, Sommore was invited to participate in Chicago''s “Just for Laughs Comedy Festival” as a featured act on the “Cedric the Entertainer''s Urban Circus” which aired on TBS. There she performed alongside the likes of other comedic greats such as Jerry Seinfeld, Chris Rock, Steve Harvey and Cedric the Entertainer. Sommore was also featured on the very successful “Royal Comedy Tour” where she was the first female comedienne to Headline over other male Nationally Headlining acts. The tour is currently gearing up to go back out in 2011 and Sommore is looking forward to once again Headlining the show and proving to others that she belongs. In addition, she is the producer of a documentary, which is currently in production and she is developing several projects for television.Sommore earned a bachelor''s degree in business administration and mathematics from Morris Brown College in Atlanta. Before she became a comedy star, she taught algebra in the Atlanta public school system, and owned and operated several businesses in Atlanta, including a clothing store, a shoe store, and a store that featured imported food and specialty products from Africa.Sommore has found success in nearly every area of the entertainment industry. She continues to be in high demand for film roles and television appearances. She plans to expand her role as a writer and producer of comedy, documentary films, and television programs. In addition, she has been involved with several hip-hop projects, including videos and recordings. However, her greatest love continues to be her first love-stand-up comedy. She is currently gearing up to once again Headline the very successful “Royal Comedy Tour” which debuted in early 2010 to rave reviews. It was also the first time that a female comedian has been featured as the headlining act over other nationally known male headliners. A feat that she Sommore continues to hone her skills and expand her reputation as a comedienne, performing to sold-out audiences across the country in both large arenas including the world famous Radio City Music Hall and Madison Square Garden in New York City and Universal Amphitheatre in Los Angeles, as well as at premiere comedy clubs such as Caroline''s on Broadway in New York and the world famous Improv''s. With her fresh approach to comedy, her distinctive style, and her groundbreaking accomplishments in the entertainment industry, she is a true “Queen of Comedy,” - a title she plans to hold for years to come..